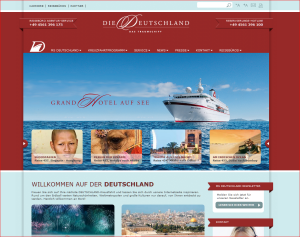 The Cruise Liner ‘DIE DEUTSCHLAND’, also known as the ‘MS-DEUTSCHLAND’ and as the ‘Traumschiff’ in the German TV series, has received a website in Typo3 with a complete new look and feel. The shipowning company Reederei Peter Deilmann GmbH asked our partner company finest communication to re-design the website www.deilmann-kreuzfahrten.de, which is dedicated to their flagship MS-Deutschland. Finest communication asked FSnD to do the technical implementation in Typo3. The website relies very heavily on impressive pictures and stresses usability. It also shows the onboard webcam through Earth TV and lists all cruises this luxury liner will be undertaking for a year ahead of time. The display of the cruise listing and detail views was implemented in Typo3 6.0 and Extbase and Fluid, the new standard for developing Typo3 extensions. It is of course database driven and can each cruise can easily be maintained using a module in the back-end. Various forms enable the visitor to make booking inquiries, contact reservations or a call-back service. As the website mainly targets a German audience it is currently only available in German. An English version is planed for next year. 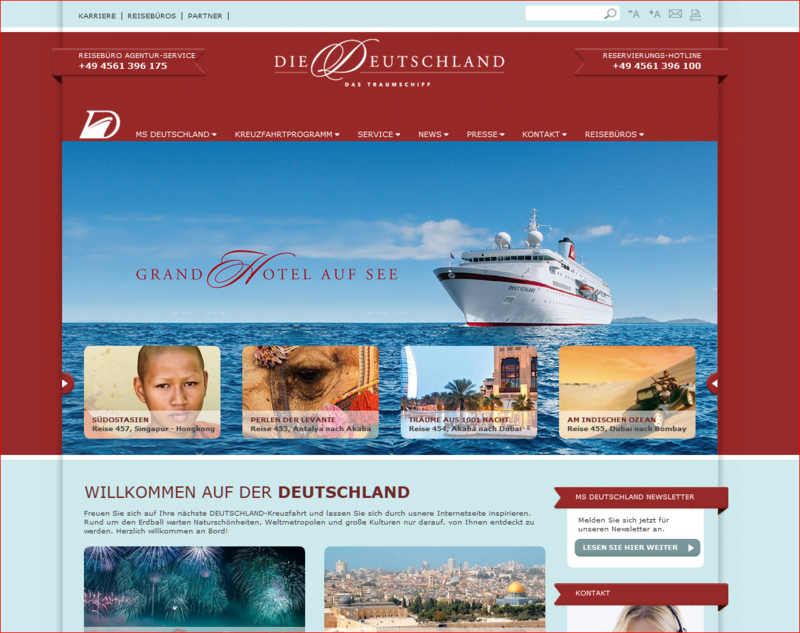 The Cruise Liner DIE DEUTSCHLAND, also know as MS-DEUTSCHLAND and Traumschiff received a new website in Typo3 with cruise listings and booking forms.